Investment opportunities on the public markets. While the stock prices of a company move up thanks to aggressive accounting policies, you will never hear a board member make a statement regarding the stock price being too high. Further more, these aggressive accounting policies may be hard to detect and recognize to begin with. After all, it may be only 1 of 20 positions for an investor. For the company and its managers though, it’s the only thing that they focus on and so we should have the tools necessary to detect these problems as early as possible. These problems are not only found in hard-to-understand businesses, but also in the easier-to-understand businesses. This includes Waste Management, a trash hauler. Financial Shenanigans starts with examples of accounting problems and their subsequent impact on the stock price. Waste Management peaked at $57 in 1999; however fell to $14 in 2000 less than 1 year later. Takeaway for investors: If a trash hauler can fool the public, get by the SEC, and keep auditors quiet, you simply have to watch out for yourself with your own analysis. 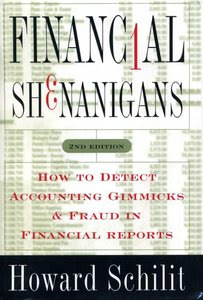 Financial Shenanigans is a 17-chapter book that was written by Howard Schilit. Each chapter is about 15 pages long and so it’s a book that you can easily read even when you don’t have a lot of time. The next 2 chapters discuss methods of finding these companies. There are quantitative methods (largest drop in cash flow versus net income, sequential sales decline, receivables growth, etc.) as well as qualitative methods (changes in estimates, customer financing, bill and hold, nonmonetary transactions, etc.) to help detect this. The book also walks readers through a common-size analysis, where balance sheet items are represented next to the income statement as a percentage of net sales or revenues. This can give you clues as to where the problems may exist. The pooling method’s loophole was closed up in 2002 and so it isn’t an issue now, but don’t be fooled and think that there won’t be accounting tricks in the future. The book goes on to discuss acquisition accounting tricks in lots of detail, revenue recognition problems, and wraps it all up with more history of accounting problems, including Enron. Financial Shenanigans is a book that will arm you with the tools necessary to help detect these problems early. Howard Schilit has simply done an amazing job at presenting this information in a compelling book that is enjoyable to read. Investors concerned with the possibility of fraud should be reading this book and learning just how the professionals detect fraud. Disclosure: I receive books from publishers for free because I am an editor. The links made to the Amazon page for this book have my referral code in them. This does not cost you anything and rewards me for providing an informative review. The third edition of Financial Shenanigans will be published in the next few weeks. * Earnings Manipulation Shenanigans: Learn the latest tricks companies use to exaggerate revenue and earnings. * Cash Flow Shenanigans: Discover new techniques devised by management that allow it to manipulate cash flow as easily as earnings. * Key Metrics Shenanigans: See how companies use misleading “key” metrics to fool investors about their financial performance. Great book review Ankit. It's one that I've had on my list for a while but never got around to. Keep em coming. Looking forward to more valuable books to read. Thanks Jae, I appreciate it. I should have a review for "Fooling Some of the People All of the Time" very soon, it's a great book too. I follow the belief that there is no such thing as a bad asset, only a bad price. Price is my only measure of risk. Contact me (Ankit Gupta) at ankit.gupta[-at-]me.com with any questions/comments.